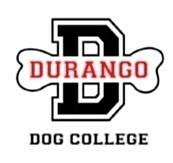 ​Durango Dog College LLC is a professionally shared indoor dog training facility located in Durango, CO. We provide lessons with one-on-one instruction with a certified trainer, group classes, and in-home, private training. Our trainers are nationally Certified Dog Trainers who successfully prepare you and your dog for such tests as the AKC CGC (Canine Good Citizen) Test, Therapy Dog testing and training, and general Manners classes, excluding an outdoor Manners class. We also offer nose work (scent detection) classes. We train by using positive reinforcement that is based on proven, science-based techniques that are efficient, fair and fun for both the dog and his handler.